Otago Harbour is without doubt one of the most beautiful stretches of water in the world. It runs for 24 kilometres in a north east to south west direction from Taiaroa Head with Harington Point to port and Aramoana to starboard at its seaward entrance as one enters the harbour, and is protected by the hills of the Otago Peninsula on the easterly side, with the ports of Port Chalmers and Dunedin on the westerly side. 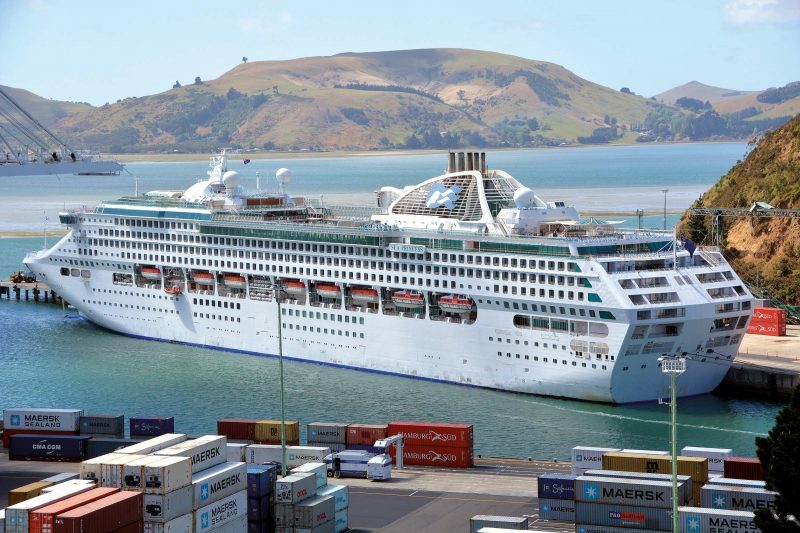 Port Chalmers is half way along the harbour whereas Dunedin is near the landward end of the harbour. 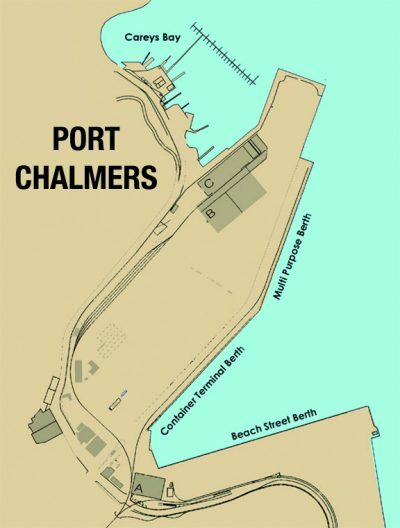 Port Chalmers is located on a small hilly peninsula, with the important tall gantries of its container terminal lying opposite to the other wharves of the port. Two beautiful wooded islands, Quarantine Island and Goat Island, lie across the harbour between Port Chalmers and the Otago Peninsula, and the wooded shores of the environs around Port Chalmers are very scenic. The New Zealand Marine Research facility lies directly opposite Port Chalmers, and the highest point of the Otago Peninsula is the extinct volcanic cone of Harbour Cone at 984 feet in height. The dredged Victoria Channel outside the harbour at Port Chalmers up to Dunedin is narrow, and consequently the vast majority of port activity is centred around Port Chalmers rather than central Dunedin. The Otago peninsula offers a wide range of attractions including rare wildlife, historic buildings, woodland, gardens and coastal scenery. The forty mile round trip of the peninsula taking the ‘high’ Highcliffe Road over the top, and returning via the ‘low’ Portobello Road gives one a full day of magnificent sightseeing. Larnach Castle on the peninsula was built by the politician and businessman William J. M. Larnach as a grand stone mansion in the ‘Scottish Baronial’ style with a great many interior treasures e.g. elaborately carved and decorated ceilings and a large, hanging staircase created by English and Italian interior designers. The Royal Albatross Centre on the prominent Taiaroa Head was opened in 1989 and has observatories, galleries and information on these lone wandering birds of the seven oceans, together with a colony of Stewart Island shags visible from the observatory as well as penguins, fur seals and other maritime mammals. Port Chalmers has a long history as a port town and today the relatively small population of working class and middle class residents are a mixture of Scottish and Maori descent. The Maori names for the area around Port Chalmers were Potakere and Koputai at the southern end of their Kai Tahu territory. The schooner Anne was under construction in 1840 in the area, but that year had seen the sale of the whole western shore of the Otago Harbour sold by the Maori leader Taiaroa to two French whalers, who were brothers in law and business partners. In 1844, the sailing ship Deborah under Capt. Wing anchored in what today is Deborah Bay, where he was joined by Frederick Tuckett, who selected an adjoining block of land to be the Scottish New Edinburgh settlement of Dunedin. The sale was concluded to the Otago Association from the Maori people on 31st July 1844 at Port Chalmers. There were two small wharves in the port and the Port Chalmers Town Board was formed in 1846, with the first two sailing ships from Scotland, John Wickcliffe and Philip Laing, anchored at Port Chalmers in March and April 1848. In 1860, tugs were towing lighters full of cargo up Otago Harbour to Dunedin from Port Chalmers, and the Otago Harbour Board was set up on 30th June 1874 at Dunedin, with a nine man committee including the Superintendent of the Board. As early as 1854, only six years after the foundation of the settlement of Dunedin, representations had been made to the Otago Provincial Council that it was desirable that all vessels entering Otago Harbour should be able to get as close as possible to Dunedin. There was no Harbour Master at Dunedin until December 1859, when Capt. Thomson was appointed to the post and commenced his duties on 16th January 1860. The first public meeting that was called to form an Otago Harbour Board occurred on 4th March 1873, with E. B. Cargill as Chairman, and an eight man committee was appointed to promote the formation of an Otago Harbour Board, which was given consent by the Governor of New Zealand fifteen months later. The bucket dredger New Era had been purchased in 1866 and was employed for several years in cutting various channels up to Dunedin. Another dredger was obtained at a cost of nearly £20,000, but dredging operations failed to increase the draft significantly, and Dunedin had to be satisfied with the coming and going of small craft only. The proposal to construct the Victoria Channel was brought forward around the year 1877 to secure a depth of 16 feet at low water up to Dunedin. This channel was later deepened to a depth of 20y feet at low water and widened from 120 feet to 150 feet. This meant that on the incoming high tide of six feet in height, vessels drawing around 21 to 23 feet could reach Dunedin. The Otago Harbour Board took out loans of £687,000 between 1874 and 1885 to complete the dredging work. In 1874, the Rattray Street jetty at Dunedin was extended to 1,140 feet in length at a cost of over £12,500. The harbour craft of the Otago Harbour Trust by 1893 included the tug Plucky and the more powerful Koputai. The twin screw tug Dunedin of 345 grt was built in 1914 by the local yard of Stevenson and Cook of Port Chalmers. The twin screw hopper dredger Otakou of 1,933 grt was completed in July 1929 by Fleming and Ferguson Ltd. of Paisley on the Clyde and made the long voyage out to South Island. The Otago Dry Dock at Port Chalmers had been completed by 1893 with a length of 328 feet, moulded width of 67 feet and a depth on the sill at ordinary tides of seventeen feet and at high spring tides of nineteen feet. The dock was later lengthened and was capable of taking vessels up to 530 feet in length. The maximum allowed draft for docking was nineteen feet, and the dock had a travelling crane of 15 tonnes capacity. A privately run ship repair yard adjoined this dry dock, with a workshop containing engineering tools and a steam hammer suitable for the heaviest type of work. The whale factory ship C. A. Larsen (ex San Gregorio) 13,246/13 built on the Tyne by Swan, Hunter and Wigham Richardson Ltd. for Eagle Oil and then sold to Hvalfanger A/S Rosshavet (Rasmussen and Konow) was the largest ship to be dry docked at Port Chalmers at 527.2 feet in length. The Otago Harbour Board offices were completed in 1884 to a design by the architect Francis William Petre (1847-1948) at a cost of only £2,000, as the Victoria Channel had cost a fortune to develop and dredge. The two storey offices were plain with nine windows on one side of the corner site and five on the other side. The building was remodelled in 1936 and the entrances were repositioned. Francis William Petre was born in New Zealand and became famous for his designs for the Catholic Cathedrals of Dunedin and Christchurch, and the Dominican Priory in Dunedin. He worked his designs in both classical and gothic styles of architecture, but for the Otago Harbour Board offices he chose the ‘Italian Renaissance Revival’ style.